USA Karate Martial Arts Academy specializes in helping people develop a healthy mind and body, and to feel more secure through quality, comprehensive, and professional karate instruction. Whether your goal is self-defense, greater confidence, physical conditioning, stress reduction, flexibility, coordination or sport, USA Karate is the POWERFUL ALTERNATIVE that will get you the results you are seeking. 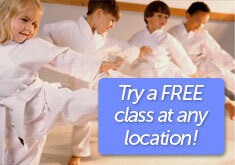 See USA Karate on CBS "Kick Your Healthy 2013 Into Gear"
There are 7 USA Karate schools in Minnesota and Wisconsin. Choose one of our locations listed and contact us today! There are a multitude of reasons to enroll in a martial arts training program. At USA Karate Martial Arts Academy, we are dedicated to providing the best martial arts instruction available. We are what we repeatedly do. Excellence then, is not an act, but a habit.